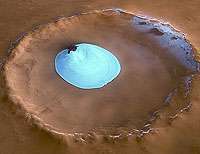 This image, taken by the High Resolution Stereo Camera (HRSC) on board ESA’s Mars Express spacecraft, show a patch of water ice sitting on the floor of an unnamed crater near the Martian north pole. This white patch is present all year round, as the temperature and pressure are not high enough to allow sublimation of water ice. It cannot be frozen carbon dioxide since carbon dioxide ice had already disappeared from the north polar cap at the time the image was taken (late summer in the Martian northern hemisphere). There is a height difference of 200 metres between the crater floor and the surface of this bright material, which cannot be attributed solely to water ice. It is probably mostly due to a large dune field lying beneath this ice layer. Indeed, some of these dunes are exposed at the easternmost edge of the ice. Faint traces of water ice are also visible along the rim of the crater and on the crater walls. The absence of ice along the north-west rim and walls may occur because this area receives more sunlight due to the Sun’s orientation, as highlighted in the perspective view. The 3D anaglyph images were created from the nadir channel and one of the stereo channels. Stereoscopic glasses are needed to view the 3D images Image resolution has been decreased for use on the internet.